Bioroids and Bombots: Space Habitat: West Sphere and Leisure. Space Habitat: West Sphere and Leisure. According to some of my reading a spherical space habitat is the optimum with respect to containment of air pressure and mass-efficiency at providing radiation shielding. The shape also the likely result of construction methods such as the bubbleworld technique. The downside of a spherical habitat is that only a small proportion of the interior will be at maximum centripetal gravity. My solution to this, the West Sphere, is to construct a cylindrical surface within the interior of the sphere. 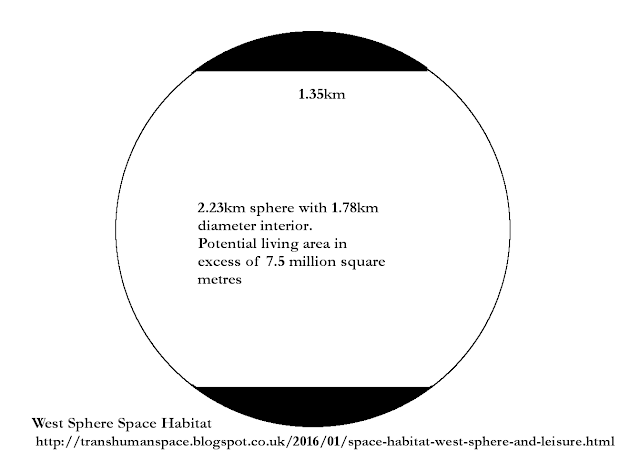 The following illustration depicts a 2.23km diameter sphere with a 1.78km diameter cylinder within. If the sphere rotates at one revolution per minute the centripetal gravity on the inner surface of the sphere will be the equivalentof 1g. The cylinder is 1.35km long in this illustration so the potential 1g area is more than 7.5 million square metres. The volume of habitat under/outward of the cylinder floor will be subject to higher centripetal forces of between 1g and 1.25g. Such g levels are tolerable for short periods of time but these areas are probably not suited to long term human occupation. Instead the higher g levels will be used for a number of other purposes. Drainage and sewage processing for the living areas is an obvious application. Many sections of this area may be used for storage. Many automated industrial processes could be located in these levels. It is possibly that some industrial processes might be facilitated by higher gravity levels. An interesting application for the higher g levels is for gymnasiums and exercise areas. A number of jogging and cycling tracks may be located in these levels. Tracks at differing levels may be interconnected by ramps so athletes can vary how much of their training is at higher gravity levels. The spherical habitat will be spun with one pole towards the sun. The solar pole will be shielded against radiation by a mass of rock. The anti-solar pole will be provided with windows and shutters. External mirrors will reflect sunlight through these windows and onto the inner surface of the cylinder. Somewhat confusingly, sunlight comes from the anti-solar end of the habitat! The shutters will allow the light level to be varied and could be used to simulate a day and night cycle. It is possible in some habitats no attempt will be made to simulate night and day. In some parts of the Earth humans function very well with months of constant daylight. Housewives in Reykjavik do their gardening in the middle of the “night” so it is possible some habitats will not bother with nigh time, or at least not full levels of darkness. The main docking area for spacecraft is likely to be situated at the solar pole near the axis. Visitors will initially be weightless. To reach the cylinder surface they will have to travel down the inside of the sphere at the solar end, possibly using some form of funicular. The lower the carriage gets the heavier they seem to become. 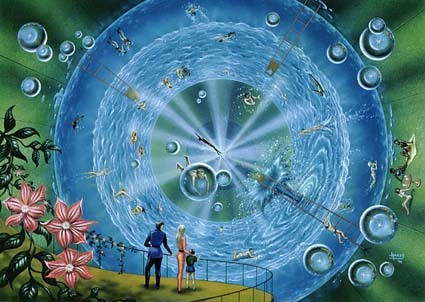 Alternately the visitor may travel down the zero g central axis of the habitat. This will be a rapid route for moving passengers or freight to locations on the cylinder surface. A number of possibly transport options can be used here, ranging from zero g trains or cable cars to simple tubes were that individuals can simply free-fall (or get blown) along. A key points tall elevator towers reach up from the cylinder surface like the spokes of a wheel and intersect the central axis, allowing travellers to descent or ascend. The gravity gradient of the habitat allows for a number of novel leisure activities. Fitness training in the higher g levels has already been described. The lower gravity levels above the cylinder’s surface allow for some interesting airborne sports. Manpowered flying machines will be quite practical, providing the flyer does not descend too low. Flight by flapping a pair of strapped on wings is also possible. Batsuits, such as worn by modern parachutists (above), could potentially stay airborne for hours at a time if flown competently. The elevator towers described above are likely to include various flight centres and rentals on their intermediate levels. It is not just sports that will take on new aspects in a space habitat. Ballet and some other dance disciplines in reduced gravity will have many new facets, with dancers leaping dozens of metres and staying airborne for seconds at a time. To exploit this ballet theatres in habitats will be built at the top of towers or tall buildings.